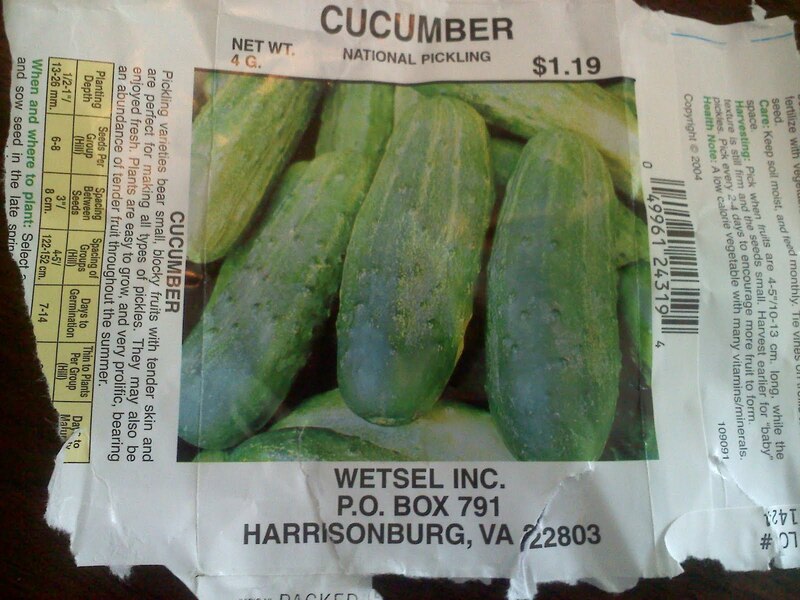 There are pickle seedlings coming up in my yard! Week 12 was our first home delivery week. In an intermittent drizzle, I delivered 12 deliveries to my neighborhood in 45 minutes, utilizing my new Burley bike trailer. 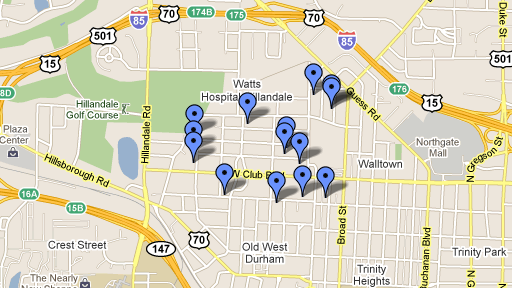 Here is a map of the deliveries, zoomed out for the sake of de-identifying my patrons. On the stand side, we had an awesome time with the Schw-Sx clan Friday night, rolling out nearly 200 matzot. Those matzot instilled a sense of disbelief in some of our customers (e.g. "You mean you made all this by hand?") I'm looking forward to posting the pictures M took of the night. Big shouts to Maria, William, J&J, Julie, RG, EC, SSS, MC & family for coming through. Thanks for CW, RML, and SZ for holding down the stand. The matzo was a foreign object to many customers, and your repeated, counseling advice helped move the product. 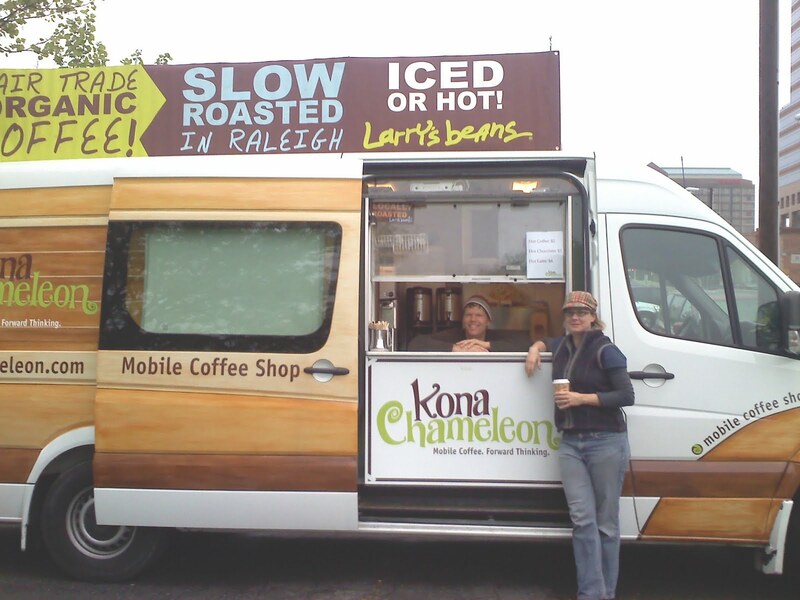 There was a new truck at the DFM -- Eric and Emily of Kona Chameleon. They have a tight setup in there -- full espresso bar, blenders for iced drinks, plus regular drip coffee. Give Eric some dap if he makes it through on the regular. They also hit up sites in RTP, catering events, and have a stand at the RBC center for hockey games. The Schw-Sx Clan Matzo Makers! Since it's Passover, I've been making matzo brei this week. Yoyo has told me that she never had as good a matzo brei as when I made it in 2007 when I first met her. I realized this morning why that might be. Back in 2007, I had a small omelette pan(~5 in diameter), in which I cooked the matzo brei. I think I lost that pan in a move that Fall and since have been cooking the matzo brei in larger pans. The issue is that the egg does not get as fluffy when the surface area in contact with the pan is large relative to the amount of egg in the pan. The same would be true for the production of a fluffy-and-textured vs a thin-and-crispy omelette. This is why at Charlie's, where you can find one of the best omelettes in Boston, they make their omelettes in very small, slightly deep omelette pans. The omelettes are fluffy and rich, then finished under the broiler for a crispy exterior. For the matzo brei, a fluffy egg makes all the difference as the bits of matzo hang in a sort of egg suspension. Without this suspension, the mixture becomes kind of slimy and runny, and when overcooked, almost inedibly bland. I think the race stuff brings up a lot of hard questions, ones that i generally steer clear of. I think that printing common stereotypes in a P.C. world can be a minefield in its own right, even when written in an objective mode of inquiry. Good journalism is a means towards provocation, and the article certainly does that. If I understand Adam's chain of causality, outsider status --> moneylending --> haggling --> ethical self-examination --> educational attainment. And here I thought I was just baking bread, not participating in theory-production! 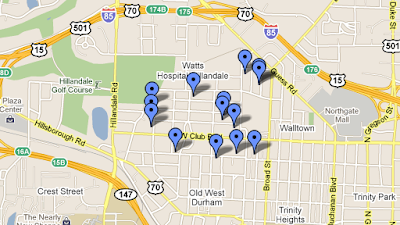 Big shout-out to Carpe Durham for reviewing us. Thanks guys, you all keep the food scene vivrant! A friend of mine asked for my vegetarian matzo ball soup recipe. With Passover coming up, I thought others might benefit from this. Very simple, but takes awhile due to the caramelizing of the vegetables. the key is when you remove the mix from the refrigerator to shape the balls, you need to be gentle as you shape them. rough handling will make them dense. (you can mix up these proportions as you like, or add or subtract based on your tastes). multiply those amounts by about how much your pan can fit and also how much broth you want (this probably makes about 5-6 servings). the veggies will reduce significantly as they cook. at first, when you add the veggies to the pan coated with oil, sprinkle salt and pepper (and any other spice you like). on medium heat, you "sweat" the vegetables. you will notice that the onions will go almost translucent. when that first stage is done (about 10-12 minutes), kick your heat down to low and prep other dishes in your kitchen. because depending upon how much vegetable matter is in your pan, the process can take from an hour to 1.5 hrs. never get the heat so high that the veggies are turning black or burnt. after about 40 minutes, the veggies will start to turn brownish, which indicates that they are caramelizing. you will want to stir about every 10-12 minutes. when you are finished with this part, the veggies will taste very sweet. next, add the caramelized veggies to a pot and cover with water. better to add a little too little water than too much -- it's easier to add water than to reduce later. add a little more salt or pepper to taste. also, better to go a little under at this stage on the s/p -- can always add more later. bring the broth to a full boil, then reduce to a simmer for 40 minutes. the broth should be reasonably free of impurities, but in case a lot of foam comes up after the initial boil, you can skim that off. after 40 minutes, you can go in there with a potato masher if you like to break up some of the vegetable matter and get it more incorporated with the broth. simmer another 20 minutes. now, when tasted, the broth is pretty close to your final product. turn off the heat source and allow the soup to cool. refrigerate overnight. if the soup is still warm when you put it in the fridge, crack the lid a little so the heat can escape. trapped heat in a fridge can create spoilage. the next day, strain the stock and discard the non-broth vegetable matter. these veggies have had all the flavor and nutrient cooked out of them. if you taste them, you will notice they have almost no flavor. all the flavor has gone into the stock. good for compost. extra stock can be frozen as needed at this stage. bring the strained stock to a boil and throw in your fresh veggies, with additional salt/pepper as necessary. add a little more water, cup by cup, if the stock is too thick/rich. simmer for about 45 minutes until veggies are tender. add your matzo balls, and take the time to warm them completely if they had been refrigerated. they can also be warmed in a separate pot then dropped into the soup bowls. Starting in Week One, we have used the phrase "fair price" when people ask, "So how much is it?" 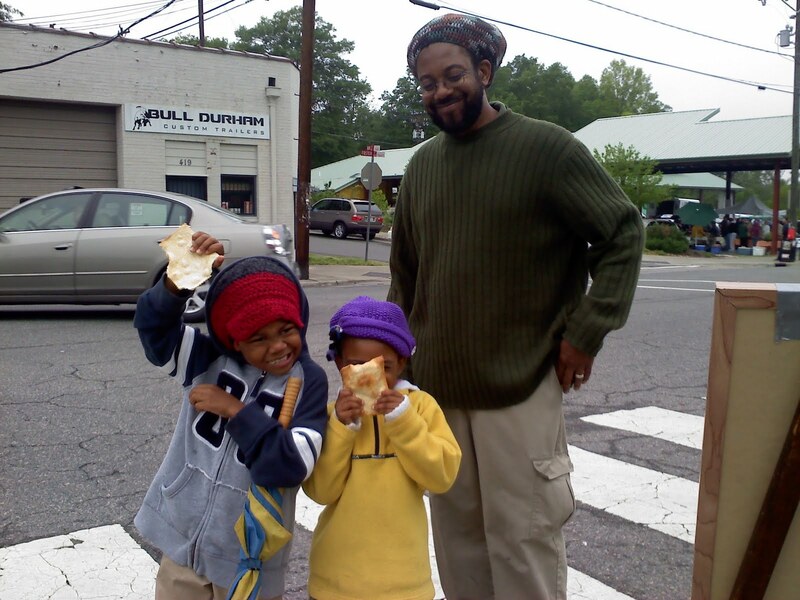 We would say, "We are a fair price bakery, meaning, we let the customer decide what is fair." The last several weeks, however, we have been experimenting with the phrase "sliding-scale". Sliding-scale denotes more of a macroeconomic judgement call. Fair price means fair to me, sliding-scale means fair to everyone, even buyers I may never meet. Our customers have been responding to the term as well. I would say, anecdotally, the average buy price is 50 cents to a dollar greater when we use the phrase sliding-scale. Two weeks ago, I was not at market due to chance of rain, but RML told me that a new stand had set itself up near our usual spot. I got to meet Atrac of Big Bean Roasters this past Saturday and was impressed both by his coffee and his story. Atrac (below) is a neurologist at Duke Hospital. 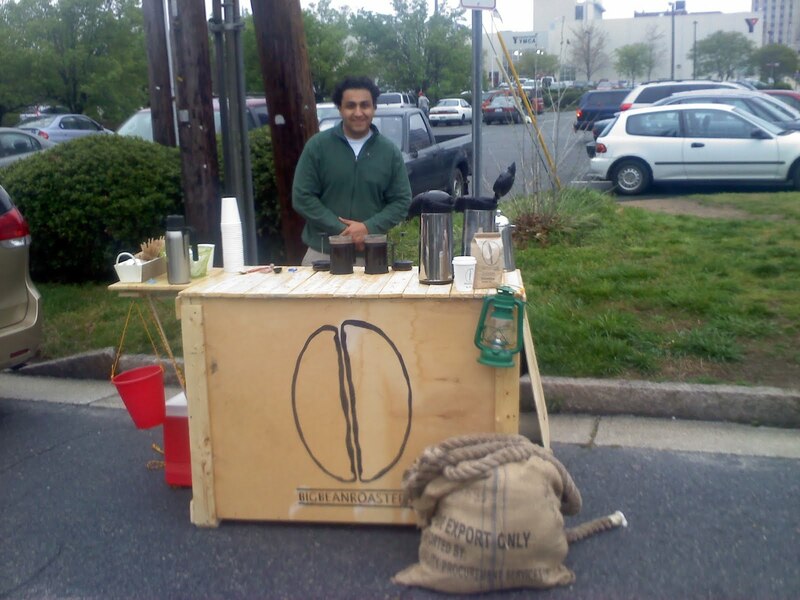 During his summers, he has done charity doctoring in Uganda, and has purchased plots of land there on which growers grow his coffee, then export it to the U.S. Atrac has mostly focused on wholesale selling, but recently got this market set-up put together to promote the bean. He sells for $1.50 a cup (cheap! ), and all the coffee is brewed by French press on premises. No one else at the market is doing French press as far as I know, and all his proceeds go back to supporting orphanages in Uganda. I'd say his whole concept is rather unique. One other note: Because we sell coffee too (Counter Culture), it would appear that we are competitors. But really, drip coffee and French press are two different animals. I happily sent patrons Atrac's way who wanted French press. Also, 1) coffee is a small part of our product mix and 2) we are actually moving into cold drink season where I will start introducing some cold flavored teas. "For decades Uganda has been producing some of the worlds best coffees. In fact, even until today Ugandan coffees are ranked among the top three in the world. Bugisu AA is the premiere arabica coffee grown in Eastern Uganda. Today this bean is quickly bought up when the season starts by large corporations and mainly used to blend into lower quality coffees to enhance the overall taste of blended coffees. Many don't know this but blending coffee is a scheme to make more money and rarely about taste. Most coffee companies don't want you to know what is inside their bags so they call them world or regional blends. Many will mix three fourths low quality beans with one fourth high quality bean in huge roasters, roast until burnt to hide bad tastes, and call it some exotic blend. We don't do that. We import the best arabica bean grown in Uganda called Bugisu, named for the region it is grown in. We give credit back to Uganda by labeling exaclty what the LOT number is or occasionally our cuppers will recommend a unique idea to blend, creating a new fruity ceamy taste. We never roast past medium-dark. The Bugisu that we sell is unblended rich and bold, remaining pure from tree to cup; coffees that can be traced back to a single orgin plot of land tucked away in Mt. Elgon. No one would dare blend a high grade specialty coffee- why ruin a good thing. It takes so much energy from the trees to grown in high altitudes. But from these regions we get coffees rich flavorful, that fruit from ancient coffee trees growing in lush misty volcanic mountain climate unique only to Uganda. This same climate produced the first coffee trees millions of years ago and today is home to the endangered mountain gorillas. Our goal is to continue to bring our beloved customers coffees from remote places on Earth. We also want to bring attention to Uganda and its coffees by selling naturally grown single origin coffee that are imported ethically and sold at a fair price locally so that all can enjoy. We do not pay any large corporation to set local 'fair trade' wages in the small villages that harvest these beans for the world. Instead we fly to Uganda where we have set up our local offices to help hand cash money in the hands of a farmers and to all employees. We select handle and process our coffees by ourselves. We focus on maintaing consistant quality and supply chain logistics. 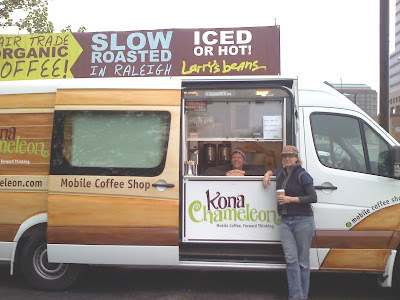 Coffees are either roasted in Kampala Uganda or Durham NC in large and small batches. We brew our coffees locally in french press style to preserve the common undertones of cherry peach chocolate and honey. We sell green bean and roasted bean container shipping wholesale retail both arabicas and robustas. In the end it is never just about money but rather having fun by linking local communities here to local comunities thousands of miles away sharing and exchanging experiences so that we all can benefit from each other. Please email us or stop by to incorporate business ideas "
P.S. Our website is being programmed and Uganda will soon be called and part of East African Union. Passover starts next Monday night, so for the occasion, we will be trying to make our own matzot. I've never done this before. The hand-rolling looks like madness. According to Hebrew law and custom, the matzo must be unleavened, and contain no yeast. The problem is, all flour has some natural yeast in it. That is how a starter is made, from the traces of yeast micro-organisms naturally residing in grain (yeast micro-organisms can also picked up by the starter from the air). So my theory is that the Israelites likely mixed their bread with an organic starter containing yeast, molded it into sheets, then set it on their backs to bake in the sun as they escaped from Egypt. The bread may not have had time to rise, but it did likely contain some starter, and probably tasted better than store-bought matzo. I just did a test batch last night and the results were good. I added a little semolina flour, some olive oil, and brushed the top with olive oil and sprinkled with kosher salt. We sold more than we have ever sold before. All of the chocolate babka was gone by 10:30AM. I managed to get a babka into Amy Tornquist's hands on her way out of the market. She said, "My staff will really appreciate this." Thanks so much to RML, SZ, JW, Mattieu for helping out. DJ Pappy held it down on the Wheels of iTunes. Click here to check out more of his mixes. They're dope. 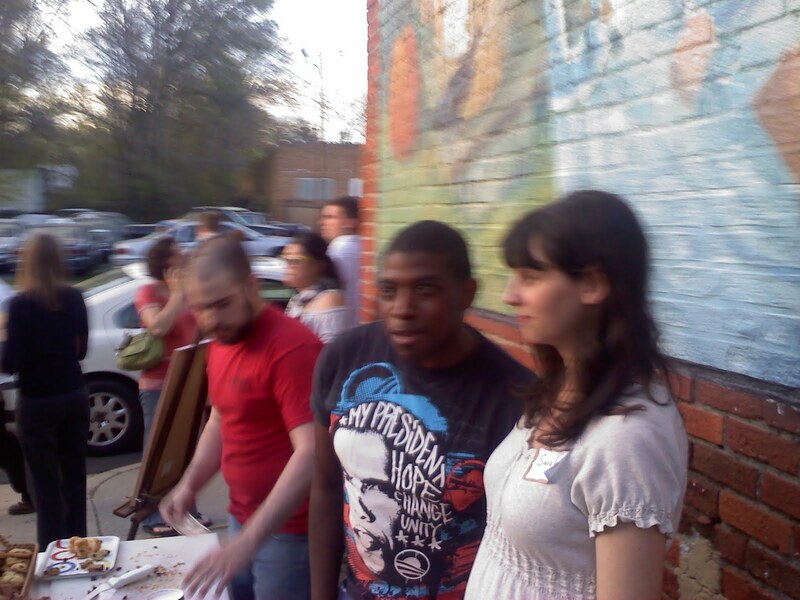 After breaking down the stand and cleaning up, we met some of our prospective neighborhood subscribers at 2PM. The neighbors were receptive to our pitch, and we got the numbers we were looking for -- 20 homes that either want to subscribe immediately or partake in a free 2-week half-share trial. This is enough to get us going and see if we can grow it in the same way that we have grown the stand business. Thanks so much to all of my canvassers: yoyo, JP, MC, SSS, BN, and AST -- it meant so much to me for you all to participate. Shouts to everyone who came through the stand: Tiffany, Annie and Andy, Adam, J&J, JP and Lori, Gaila, and Patrick. Sorry if I can't remember everyone -- I started baking at 3AM and was on the hustle straight through till 6PM. As the New York Times slowly fails and becomes an acquisition target, they've turned over to a subscription-based model akin to that for the Financial Times and the Wall Street Journal. I find their $3.75/week (with 99-cent first month sign-up promotion) digital price insultingly high, but I assume they've done the breakeven analysis on it and that is how they can make the most money off the digital edition. I wonder what would happen if they did a pay-what-you-like subscription model (with a minimum per week and guidelines by income class). Do you think they would make more or less money as a result? Attrition would go down less than with the $3.75 price, but would they make up the difference with volume? Let's make an assumption: 10% of their 30 million unique readers per month will sign up for the new service. At $3.75/week, that's $45 million in monthly income. If instead, 50% of the readership signs up for pay-you-like, the pay-what-you-like price would have to average 75 cents per week to "break even". If 70% of the readership signs up, the breakeven would be 26 cents per week. What do you all think of these numbers? I met Mark from Big Spoon yesterday. Nice guy. If you are at the Carrboro Farmer's Market tomorrow, give him a shout. I had this experience I've been thinking about for a long time. I went to Fullsteam for the opening of the Farmhand sausage wagon back in October. I was sitting on the lawn next door, and a dad and 2 kids plunked themselves down next to us outside. They had skipped the hour-long line for the pasture-raised pork and instead brought back Happy Meals from the McDonald's around the corner on Morgan St. As they were digging into their fries, I couldn't help but sympathize with the father, even as those around us gave them looks. How do we make eating healthy, responsibly, and cheaply as accessible as McDonald's? This music has been keeping me up while prepping for tomorrow's rodeo. What do you listen to while you're cooking? Google Checkout is secure, fast, and takes Visa, Mastercard, Amex, and Discover. 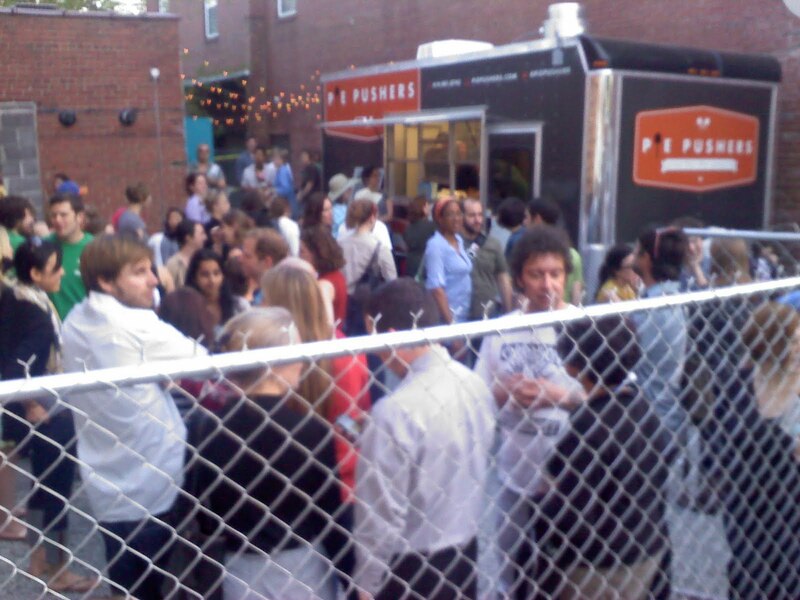 There will be a Food Truck Rodeo (which we will attend) this Thursday April 7, 7-9PM to support the new food concept incubator, The Cookery, run by Nick Johnson. I met Nick 2 weeks ago and checked out the space....looks accommodating for medium-sized catering jobs/food trucks/value added processing. He's also planning to pair the kitchen rental with food entrepreneurship consulting and marketing services. I think it would be awesome if it became a full service food concept lab. I have yet to check out the new similarly-themed $1.2 million site opening in Hillsbourough (Piedmont Food and Agricultural Processing Center), but I hope Nick and his crew are quick enough on their feet to meet the needs of the finicky, highly-educated foodies of Durham. Good luck, Nick! Yeaaah. 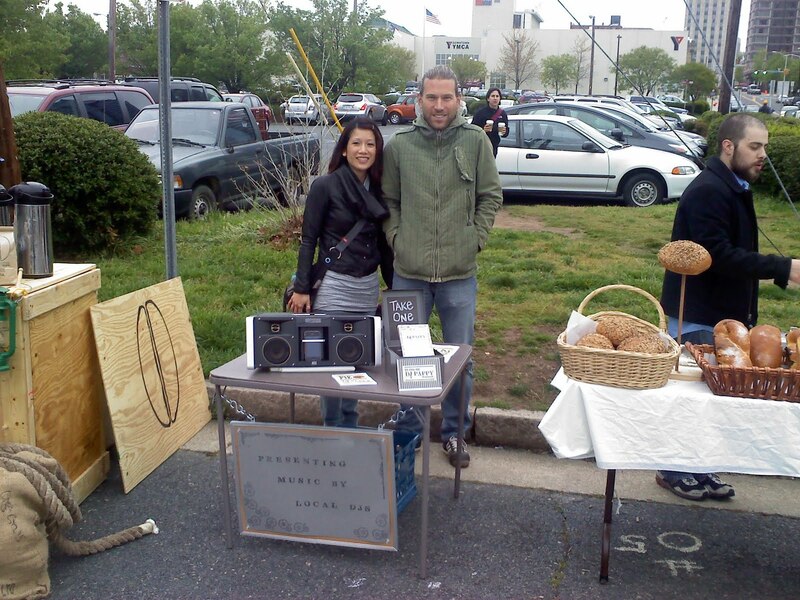 We had a great day at the market yesterday with newly expanded hours. I got some of the best compliments I've ever received on on the hamentashen with sweet poppy filling (we brought that back for one more week because we sold out 2 weeks ago and I wanted to give people the chance to try it if they missed it; also, I had extra unused hamentashen dough): one customer said it was unlike anything she had ever tasted before; another asked if they would freeze because he wanted to bring it to his friend in DC to show him what "real" hamentashen tasted like (I said no). There was a new food truck present at the market. Sweet and Savory Express hail from Atlanta, where there are no food trucks allowed. Patrice hooked us up with some chicken and waffles and a chili dog. Looks like competition for Dame's. 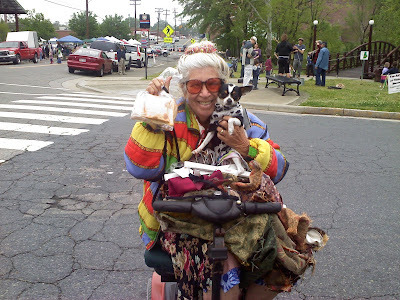 I saw the venerable Amy Tornquist prepping for her guest chef slot at the Market. She's as close as Durham cuisine gets to a Mario-Batali-sized celebrity chef. We tried to flag her down to sample something, but no dice (she actually parked near the stand). Another time, Amy! Many thanks for BS, SZ, and RML behind the table -- you guys held it down. Also, we had numerous surprise guest patrons. BW all the way from Florida, with family DW, SW, AW. Also MC, SSS, Patrick, Andy, Annie, Larry and David, NS +1, Julie, Nate, Amanda, and Elisabeth, thank you so much for coming through. You guys are the highlight of the market for me. You can see the average food prep wage is $8.29/hr. The beet was Rasputin's favorite vegetable. You could see it in his eyes.